The most advanced Ambassadeur ever! The same rugged knockdown construction every trophy hunter relies on, plus a unique 6-bearing system featuring 4 corrosion-resistant ball bearings and 2 roller bearings, an exclusive Sensi-Brake spool bearing for super-smooth retrieves, and an Instant Anti-Reverse™ bearing. Vented spool for easy casting; rugged Carbon Matrix Drag. High-capacity HC models have a drilled power handle. "I have had this reel for almost 2 years now, and must say , what a reel. This thing is so easy to clean and maintain, but the length of a cast is awesome." "Like so many of us - I've used 5000's or 5500's for 20 years or better - I'm almost 40 - they've always been around my house. " "I have the 40 and the 60. I love both. It might not have the personality that the International classic Abu Garcias do, but it's still great." 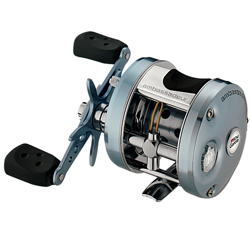 "I have been wanting to get a heavy duty reel for fishing catfish. I went to my Basspro in Council Bluffs, IA. The reel guy of the day "Mark" recommended this one. I told him I hated baitcasters. Everytime the line would tangle and I would spend 10 min. fixing it. "